Plants annual. Stems erect, simple or branched, (6-)20-30(-60) cm; internodes glabrous or midstem ones slightly scabrous. Leaves: sheath 1-2 mm, ± as long as wide; blade 3-veined, linear to linear-lanceolate, 10-30 mm, margins serrate-scabrous. Inflorescences capitate; inflorescence bracts and involucel bracteoles enclosing flowers, broadly ovate, brown-scarious, apex obtuse or of outer bracts mucronate. Pedicels 0.1-1.5 mm. 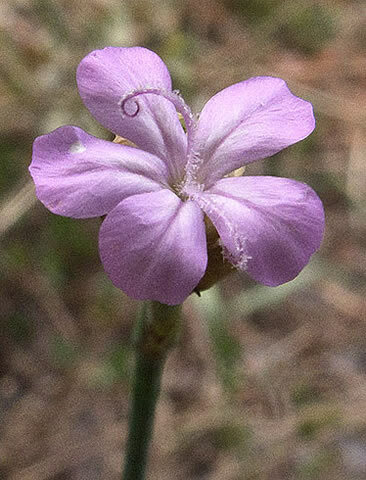 Flowers: sepals (7-)10-12 mm; petals pink to slightly purplish (rarely white), primary veins 1, veins not darkly colored near base of blade, apex truncate or emarginate.